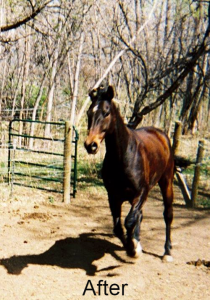 Here’s what Nicole Sacchitella in Boulder has to say about her hard-keeper horse Puck. Check out his before/after pix, too. 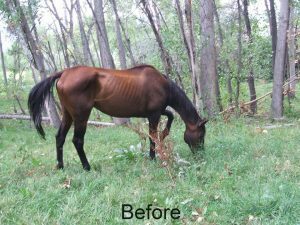 “Before I began using EquiPride, Puck was a typical skinny and sensitive Thoroughbred. Over the last winter his coat had become very dry and as it shed it fell out in clumps of dead hair with dry skin. Being a hyperactive horse mom I felt as though I had tried everything to improve his constitution but as his health seemed to fade aesthetically I was starting to worry. My farrier recommended I try getting him on probiotics before calling in the ‘big guns’ (the vet!). “After a week of the EquiPride supplement his eyes had started to sparkle a little more, and I noticed a new energy to his step. Within a month his coat had come back in shiny and without the strange dry patches! His normal stiffness in his hind end seemed to have disappeared, and my farrier noticed his feet were tougher. Now, about 4 months later my skinny TB can barely fit into his girth! Overall he seems healthier, happier and even… dare I say, younger!